The past few months you have been training hard, putting in all those hours, all that sacrifice of family time, work time and socializing as race day approaches. You did everything you were supposed to from hill work and speed work to endurance and strength. You are ready, very ready to tackle the big day. It comes before you know it and suddenly you realize all those months of hard work and sacrifice were completely thrown away. The pain and suffering were unbearable it took every single ounce of willpower and strength to get to the finish line, you kept telling yourself over and over why did I do this ?, why did I put myself into this position ?, you wanted to quit a hundred times, you couldn’t take it anymore and eventually you succumbed to the complete shut down of your body and swore never to do this again. Why? Because you forgot about the most crucial element of your training and racing and that was your nutrition. You pushed it aside, you neglected it feeling it was unimportant and yet on race day it came out and showed you who was the boss. Training for an event consists of many facets. A holistic approach is always required and this means the training itself (however structured), strength should always be included in that not neglected, rest and recovery of which nutrition plays the most crucial part. However there is another very important factor and that is the energy system. How are you going to fuel yourself leading up to and on race day and how are you going to practice this to make sure you know it works and can stick to. This is called training your gut. It doesn’t just consist of actual race fuelling, it consists of the week, and days leading up to the event and it needs to include pre-race meal prep and race fuelling. This has to be tried in training and it needs to be tested over and over again until you have it spot on. If you fail to prepare your nutrition you will most likely fail to achieve your goal. So the next question is how do you prep your fuelling for a race? The first thing I tell athletes is you need to find the least amount of fuel to achieve the greatest result. So where do we begin. I like to start with the pre-race meal. So this takes place when training sessions are more middle distance, not too long and you can do fasted training sessions. To mix training fuel and pre-training fuel together is just plain silly. Ever heard of that expression too many cooks spoil the broth. It could not be more true in this case. You need to see how your body responds to the pre-training meal. It needs to be tested from a digestive comfort point of view ensuring no bloating, excessive gas, cramping, nausea, heartburn etc. The only way to test this is on its own without anything else in the mix. Consume it anywhere 1-4 hrs before your session. Ideally around 2 hrs before is best however with training it will generally be an hour or less based on time allowances for most athletes. Recommendations would be 1-4 grams of carbohydrates per kilogram of body weight and I recommend adding a little protein into the mix. Fat can also be added but understand that its not an easily accessible fuel source unless its the correct fats and you are following a lower carb higher fat diet. In general even for ketogenic athletes I would recommend carbohydrate consumption but on the lower end. Secondly if you opt for a meal 2hrs before a race and its in the region of say 300-400 calories then I would halve this portion if it was an hour before training to ensure digestive comfort. So the further away the meal the higher in caloric content it can be but the closer to training the smaller it needs to be as it needs to settle into the system. An hour would be good. So half of what you would consume 2 hrs before your race. This needs to be tested a number of times on middle to longer runs and experiment a little to see what makes you feel at your best. Once you have this correct then move to race fuelling. Race fuelling needs to be done separately from the pre-race meal. Again I need to emphasize that one can impact the other and we want to test them in isolation before combining them. When looking at how you are going to fuel during your race you need to take two factors into consideration one being hydration and the other being energy. I always suggest separating out these two components as each has a different function. Fluid is required to ensure the body is hydrated before and during the event and it’s worth ensuring at the start of the session you are properly hydrated. 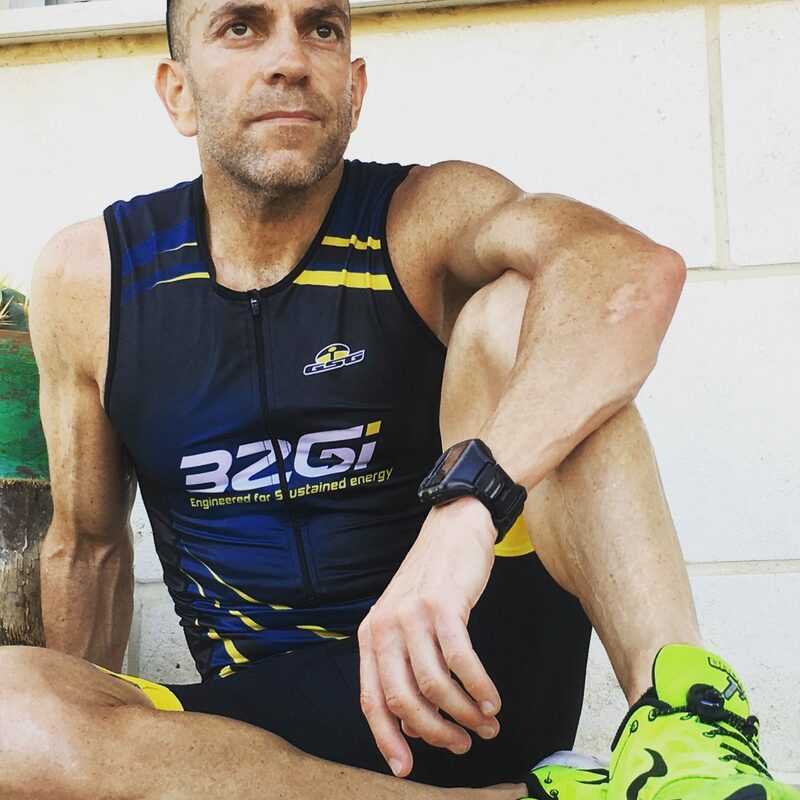 I am a fan of mineral loading and use 32Gi Hydrate (Click here listen to a podcast I did to learn more on Hydrate) which is a hyptonic drink to maximise my hydration levels before the onset of exercise. The idea of hydrating ones self is to try to replenish around 80% of fluid lost in the form of sweat during exercise and this needs to be tried and tested under various conditions. Dehydration as low as 2% or more can impair performance so one needs to take careful consideration to plan their hydration properly. There are factors that affect the availability of fluid and these are mainly the factors that influence gastric emptying rate and intestinal absorption. Factors that affect gastric emptying are things such as calorie content, temperature, hydration, volume of fluid, exercise intensity and stress. Intestinal absorption can be impacted by intensity, osmolality, carbohydrate content and sodium content. If you want to understand more on hydration refer back to my blog on hydration (Simply Hydrate) for some more insight. Experiment under various temperatures in order to get an idea of the nominal amount of fluid required to keep your body at its best for performance. One way is to weigh yourself before and after a training session and get an idea of fluid loss according to weight loss. Once you understand this you will be able to get an idea of your fluid intake requirements. Remember water on its own does not absorb as fast as a solution with salts so its best to take that into account when training or racing in a warm climate. Lastly remember fluid loss in the form of sweat is there to act as a cooling agent to keep the body’s engine from over heating. One way of reducing the amount of fluid loss is cooling yourself from the outside by pouring water over the head and the core area. Never try to cool yourself by over consuming fluid as this can lead to over hydration and potentially hyponatremia. Energy requirements will vary from one individual to the next. Some athletes prefer a liquid feed while others prefer a solid feed and then there are combination athletes who can do both. Energy needs to be selected according to convenience, taste, texture and functionality of course. The type of fuel that you choose for the day needs to match your energy needs. There are plenty of fuelling options available but it needs to be tried and tested in training to make sure it works and then it needs to be taken to the race. Before selecting a fuel understand your intolerance levels, for example a fructose intolerant athlete should avoid carbohydrates that are high in fructose as it will tend to aggravate the digestive system potentially leading to cramps and an irritable bowel. In that case more simple carbohydrates that are easily digested higher up would be in line with your needs. Never overload on carbohydrates. Remember the more you consume doesn’t mean the more energy you will have. The idea with carbohydrate consumption is to take in the correct amount in conjunction with your hydration fluid that is easily absorbed and processed. Overloading on carbs can impact fluid absorption and potentially also lead to muscle and stomach cramps as well as nausea and dizziness. I would recommend starting off on the low end of consumption so for a runner 20-30grams of carbohydrates per an hour and building it up over time until you reach your limit. This is what I call the point of equilibrium where you hit that perfect balance of intake that keeps you comfortable and energized throughout the session. The next level I call the tipping point and going over it will leave you feeling terrible. A runner might reach levels of up to 60 grams of carbohydrates per an hour depending on a few factors such as weight and digestive function and cyclists will tend to be able to take in more due to more stability of the digestive system and convenience of feed. A tip is to consume smaller amounts more frequently such as 20-30 min feeds as opposed to 45-60 min feeds. Its easier on the digestive system and the drip feeding as I call it will allow better stability over time. Test the fuelling on its own for a number of sessions ensure you get that balance right and once you are satisfied then move to the final step. This is where we combine our pre-race meal and fuelling in some long training sessions to test the impact of the combination. It’s possible you might need to tweak the pre-race meal or the actual fuelling slightly to ensure complete comfort and energy throughout. However if you get it right then keep testing it to ensure you are completely satisfied. Once happy bank it and take it to race day. Do not deviate from the plan. As you can see from above, training your nutrition is a task that needs to be planned and structured to understand whats best for you. Don’t neglect it as it can make or break your race.